Summer, where did you go? We rose away from Ashland, following the cerulean patches between the clouds, sure that we would find you and ride some miles in your company. But all we found was springtime. Blue disappeared and clouds blocked the sunshine. Temperatures hovered in the mid-40s to high 50s, making for comfortable climbing but chilly descents. Felkerino and I both wore jackets much of the day and I was glad to have had the forethought to purchase a pair of long-finger gloves at a local shop in Ashland when it looked like a cold front would be intersecting us. Supposedly Crater Lake had temps in the 30s today. Eek! 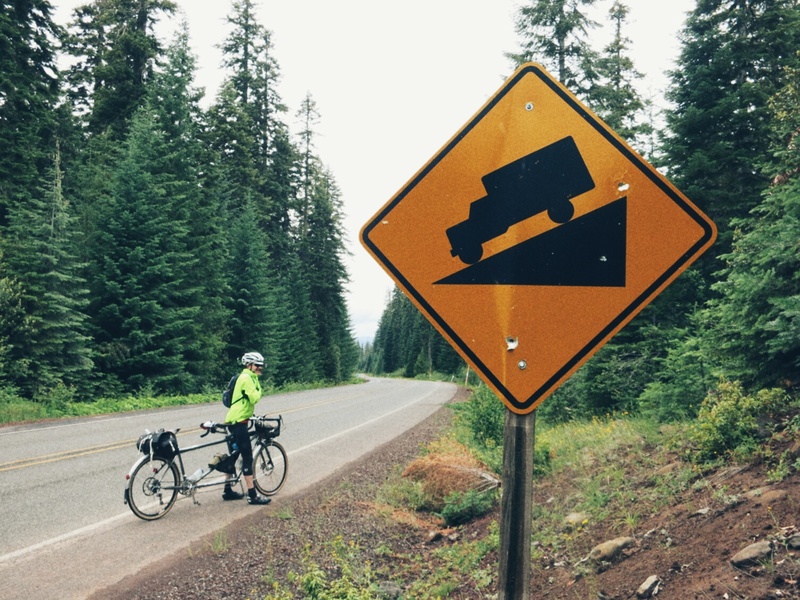 Our route from Ashland to Prospect followed a portion of Dead Indian Memorial Road, an historic highway (with a questionable name) that originally served as a wagon wheel road through the Oregon Cascades. We eventually left it to head to Butte Falls to lunch at the convenience store and then pedaled on to Prospect, where we are overnighting. Today’s ride had the feel of a spin in the countryside. Away from it all, Felkerino and me the only souls tooling down the road. Trucks on cheese. 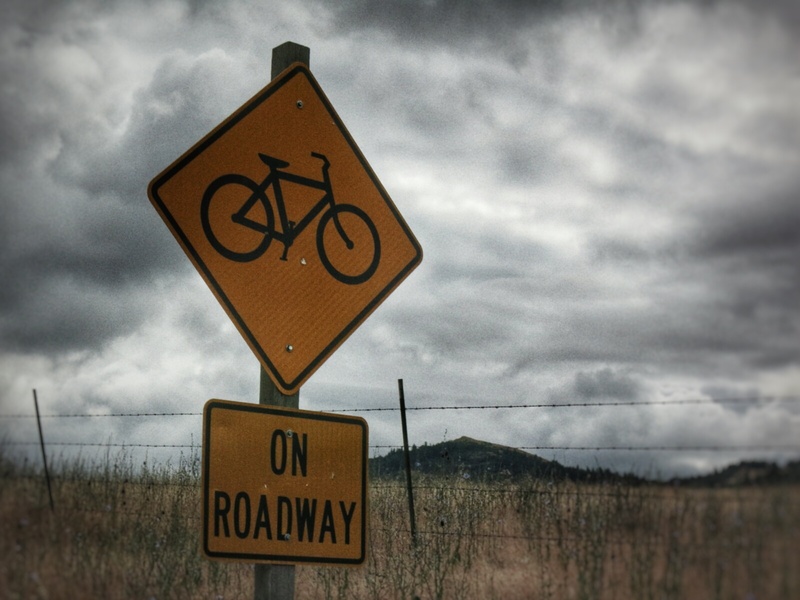 Bundle up, bike riders. I don’t know if these roads are always so sedate this time of year, or if the colder weather encouraged the nearby residents and tourists to hunker down indoors with mugs of hot chocolate. Whatever the reason, we enjoyed this day, even though it was cooler than my ideal. I like to take breaks and stand around sometimes, but the weather meant that any time off the bike would chill us. On the up side, the cool temps took away any possibility of overheating and dehydration became a non-issue. The 13-mile climb in the early miles took some concerted effort, but after that we spent most of our miles in steady rollers. And the bike sailed over some swoopy downhills, too. As we arrived in Prospect the sun came out. Better late than never, Summer! Hope to see you tomorrow. 77 miles with Crater Lake on tap for tomorrow. Nice to meet you at the coffee shop yesterday, and good to see you made it safely on your way. Thanks for the card so I could find your blog! 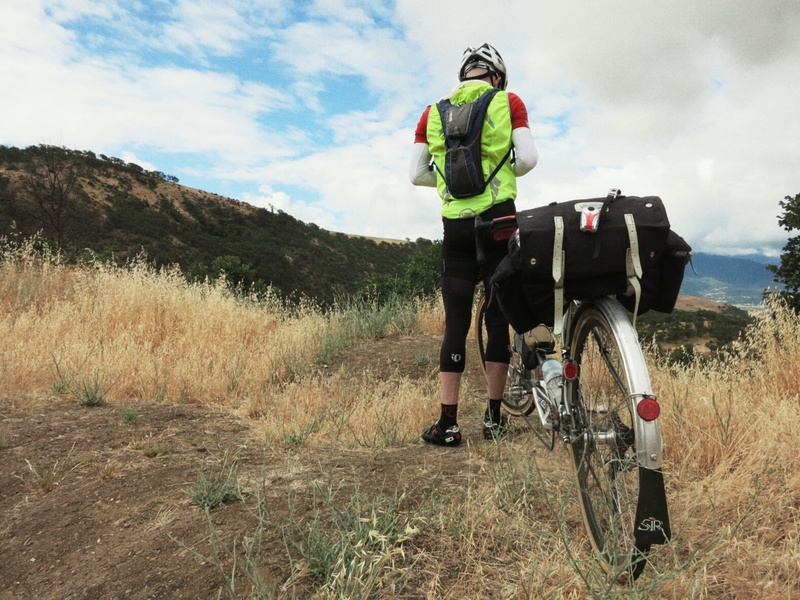 Had I known your route would head straight up the biggest climb into the mountains before going to Prospect, I wouldn’t have mentioned the orchards – that’s the “other” backroads route that stays in the valley, which I assumed you would be taking. Instead you got a great experience of the Southern Oregon Cascades. Summertime – regardless of the weather – is actually the only time you’re likely to see any cars on those small mountain roads. When we go up there in the off season for snowshoeing or hiking, it’s rare to see even one other car, except for Hwy 140 and 66. The Oregon Cascades are almost entirely NFS and BLM land, so nobody lives up there. There was a few inches of new snow sticking to the trees and rooftops at Crater Lake this morning, so it’s a good thing you took a rest day in Ashland! The route ahead should be some of the most beautiful riding on your trip, and summer returns tomorrow. Enjoy! Hi Alex, it was a pleasure to meet you, too, and fun to talk and learn about Ashland and other things. I will say that we saw a couple of orchards so you were not incorrect with your comment :). That climb was spectacular. We were so lucky with our rest day! 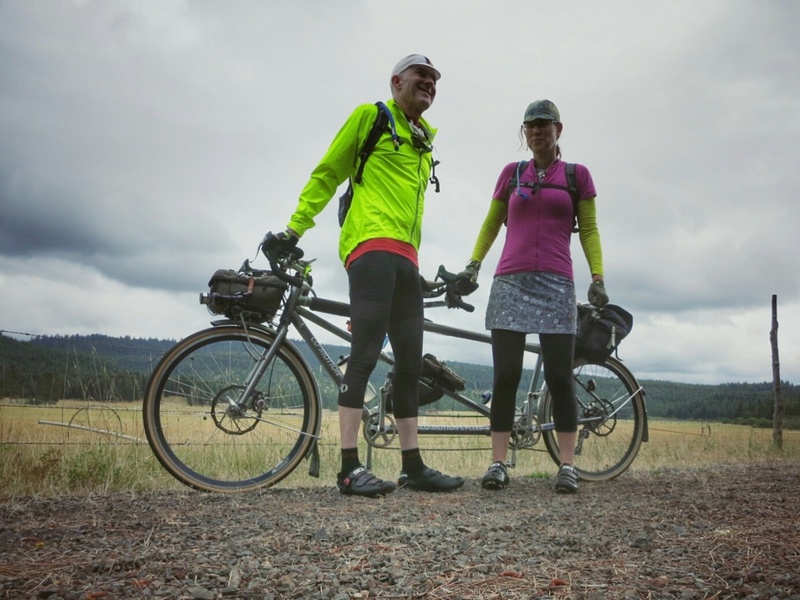 Another bike touring couple tried to go up to Crater Lake the day it snowed and was in the 30s, and I believe they ended up getting a ride to a campground because. Conditions were not really rideable. Our day was perfect- sunny, clear, and delightfully cool. We’d definitely tour Oregon again. We’ll see where next summer finds us… thanks for writing!